I have had a great long lasting partnership with Musselman’s applesauce and have reviewed all of their products over the last few years of blogging. I also had the pleasure of flying to Pennsylvania to tour the Musselman’s facilities and learn all about how their products are made. It was a wonderful experience! Recently, I was sent a surprise package containing Musselman’s latest product: large applesauces. -I love dipping pretzels in applesauce. There is something about that salty-sweet combination that I love. -I used a container of this 6 ounce Musselman’s unsweetened applesauce in a brownie recipe and it turned out great. I used a brownie mix and added my own goodies including the applesauce, peanuts, protein powder and chia seeds. It took a typically completely unhealthy dessert into a healthier option. -I also used this applesauce in a cookie recipe and used half of the amount of butter and it turned out well. 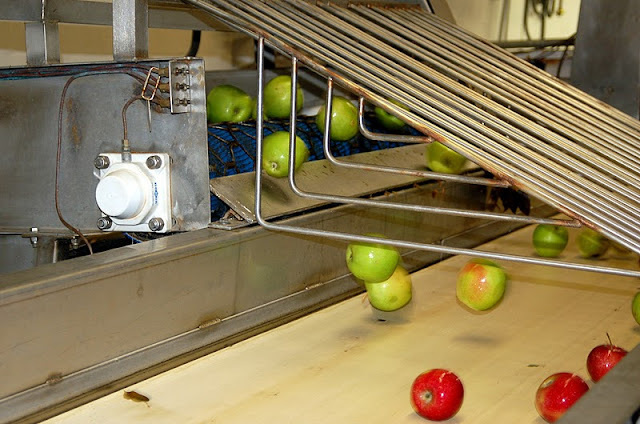 Apples at the Musselman's factory getting ready to be turned into applesauce! My favorite Musselman’s products still have to be the Musselman’s Healthy Picks line which includes flavors such as raspberry acai and granny smith. You can find Musselman’s applesauce at your local grocery store. The giveaway will be for 3 packs of Musselman's Applesauce Big Cups and a large coffee mug. I add it to certain cakes that I bake for moistness. I like to add it to cupcakes! I sometimes use it to make applesauce cake. Applesauce is awesome cooked in with your saurkraut and pork. I mix it in my oat meal with a dash of cinnamon on top. I use it in cakes. I have never used applesauce in a recipe. I love to eat it on it's own. I use it as a topping on my potato pancakes!